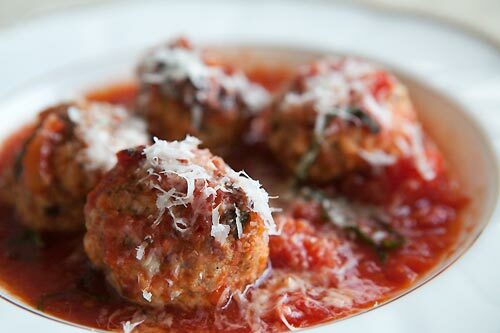 In honor of International Tempranillo Day 2012, I offer up my “Most Amazing Meatballs” Recipe! These meatballs remind me of the tapas-style Albondigas the anh (adorable new husband) and I feasted on in Madrid just a few short months ago. These meatballs can be served up however you like…with spaghetti, on a sandwich, as a tapa, or you can do like I do and “pretend” to eat healthy by serving them up with a nice green vegetable. Just don’t forget the Tempranillo! 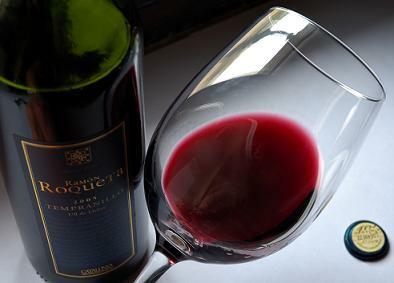 For more information on Tempranillo and suggested food pairings, see my Tempranillo Cheat Sheet. Crack the egg into a small bowl and beat well with 1 cup water. Set aside. Place the ground beef, pork sausage, bread crumbs, parsley, Parmesan cheese, salt, and pepper together in a large bowl and mix well to combine. You have to get your hands in there. Pour the egg and water mixture over the top and mix well again to combine. Divide the meatball mixture roughly in half and form each “half” into eight meatballs. You should have a total of 16 meatballs, about 2-inches in diameter each. Place the amazeballs on an oiled cookie sheet and bake 350º for 20 minutes. Sauté the onion and garlic in 2 T. olive oil over medium heat for 5 minutes, stirring occasionally. Watch the pan so the onions and garlic do not brown, you just want them to soften. Add the diced tomatoes and their juice, the wine, salt, pepper, and cinnamon and simmer over low heat for 40 minutes. Add the seasoning, adjust the seasoning, and add the finished meatballs. Simmer the meatballs for five minutes and eat immediately, that evening, or the next day. This is one of those dishes that gets better after a few days. The meatballs also freeze beautifully in the sauce. If you eat all the meatballs and have sauce leftover, use it to make a pasta dish or whatever strikes your fancy.